Now that I’ve shown you what Victorian bathrooms SHOULD be, and how gorgeous they can be, are you ready to see what we have now? The bad news : There is literally NOTHING that is original. 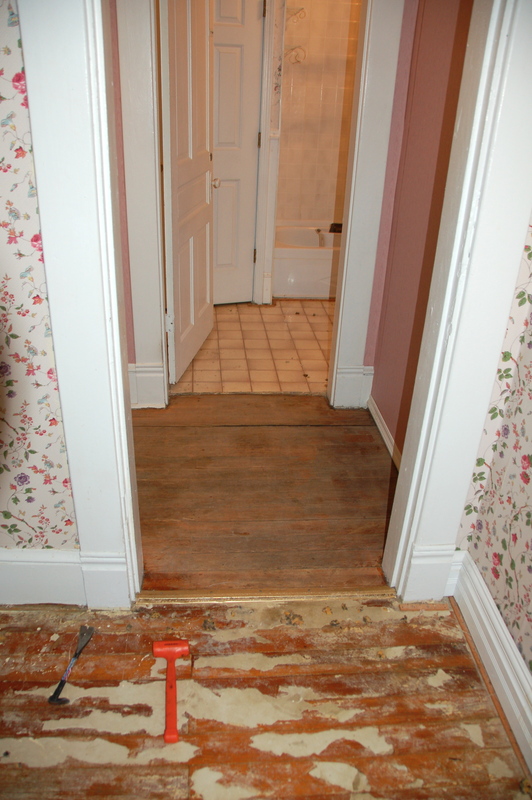 I really, really wish we could be talking about preservation, and not about renovation. The good news : There is space, and a completely blank canvas. 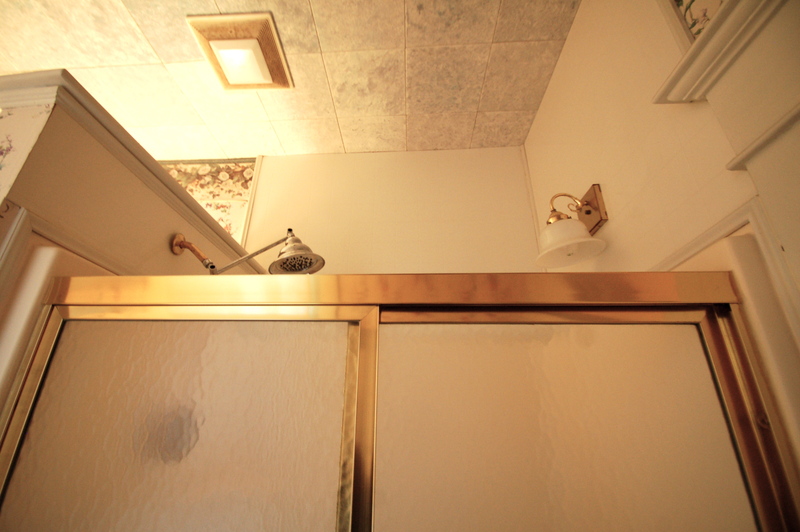 And for someone who LOVES to design a bathroom – I’ve got plenty to work with. 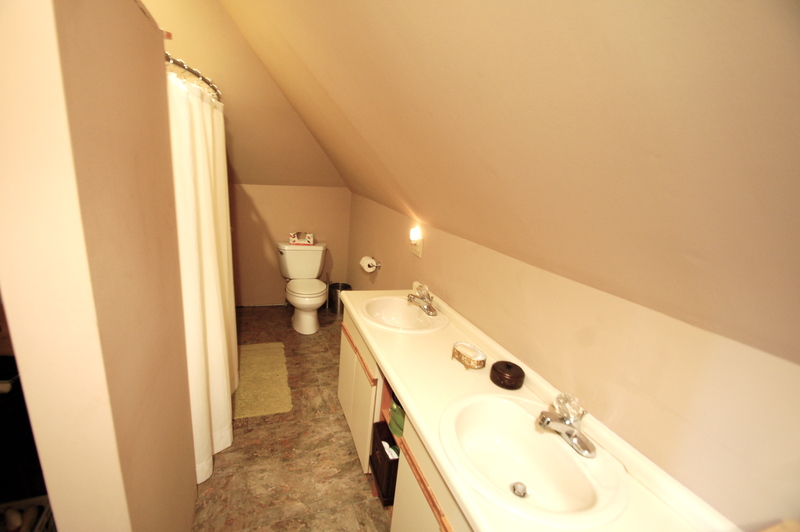 Currently, there are four bathrooms in the house, at various stages of operation. In the end, we’re going to add a fifth bathroom, which seems like overkill, but it really is going to make the house function so much better. Hopefully this will all make sense! By Realtor standards, we’re currently a 9-Bedroom, 4-Bath House. We’re going to end up with a 7ish-Bedroom, 5 Bath House. On the first floor, we have an Entrance Hall, Parlor, Dining Room, Library, Butler’s Pantry, Kitchen, Laundry Room, and one (technical) bedroom. 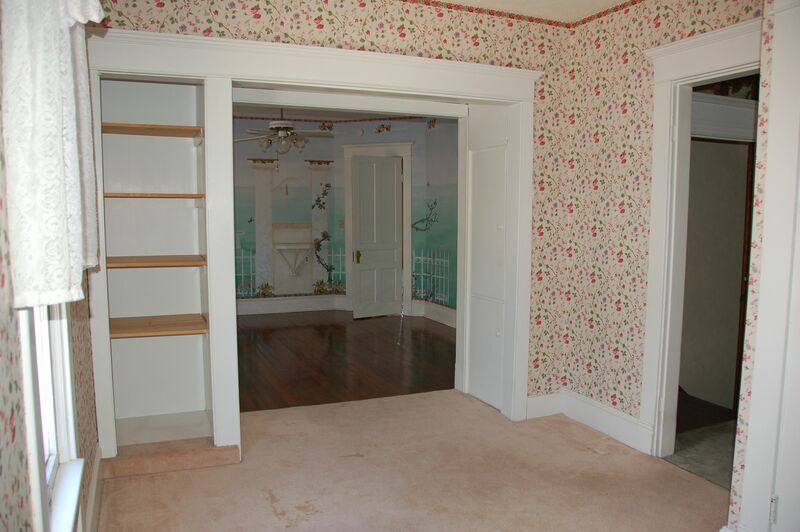 This bedroom with a closet was most likely a casual breakfast room / informal family dining room originally. We’re not going to use it as bedroom – it’s going to become Doug’s Study. Off this room is the sole bathroom on this level. 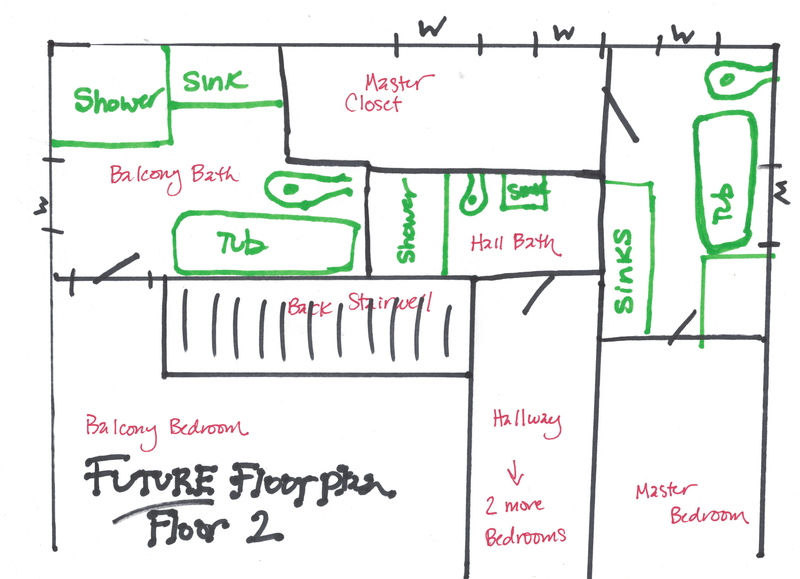 Side Note: NONE of my ridiculous drawings / floorplans are done with any sort of skill, or done to scale. But you’ll get the idea, and have something to chuckle at! 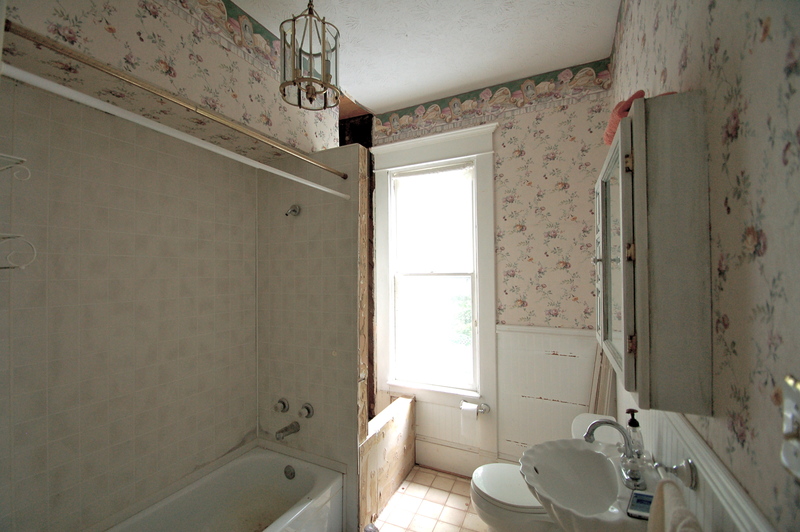 I’ll go more into detail on this room in the next post (because THIS is the bathroom we’re getting ready to start!). 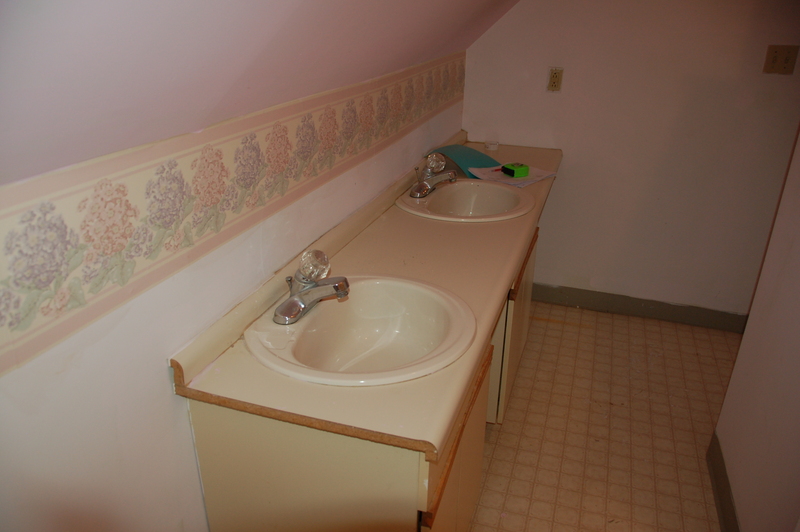 All of the bathrooms were redone (to our knowledge) sometime in the 90s. This bathroom has a functioning toilet and sink, but the shower does not function. 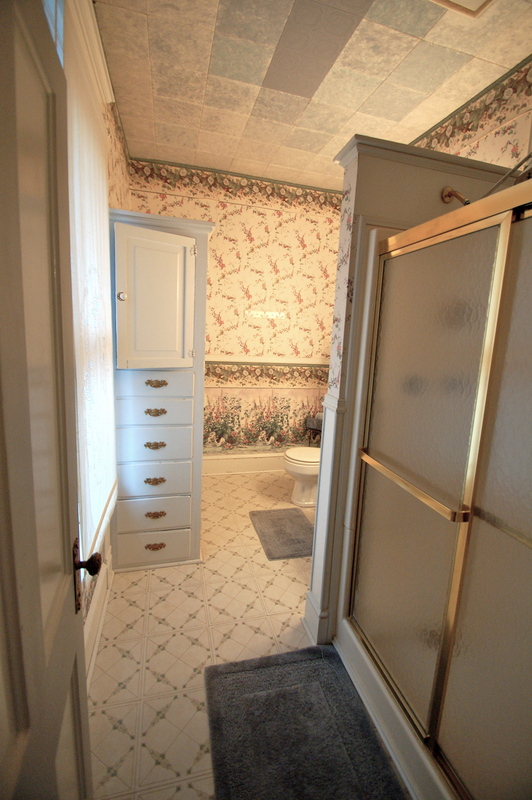 Initially, we thought about just making this a powder room, but then I lose a clawfoot tub opportunity (cue the tears), and we know it’s smart to have a full bath on every level. What do you do when your shower doesn’t work, AND you don’t have a lot of closet space? 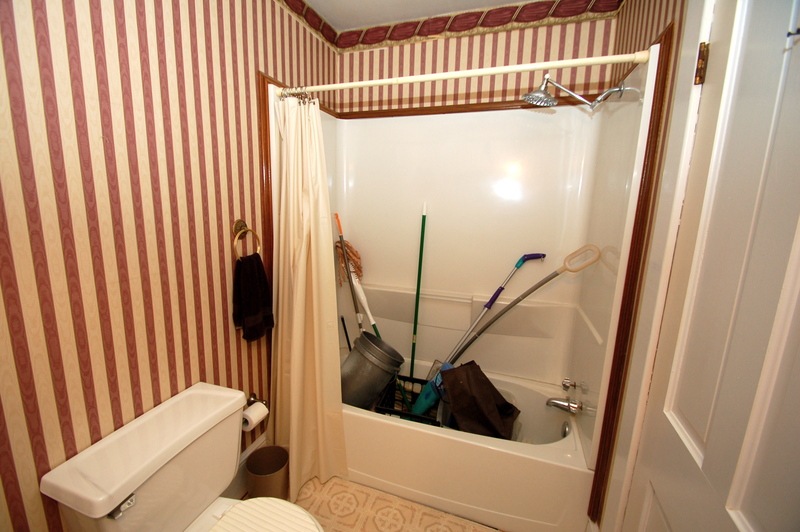 You make the shower your broom closet! 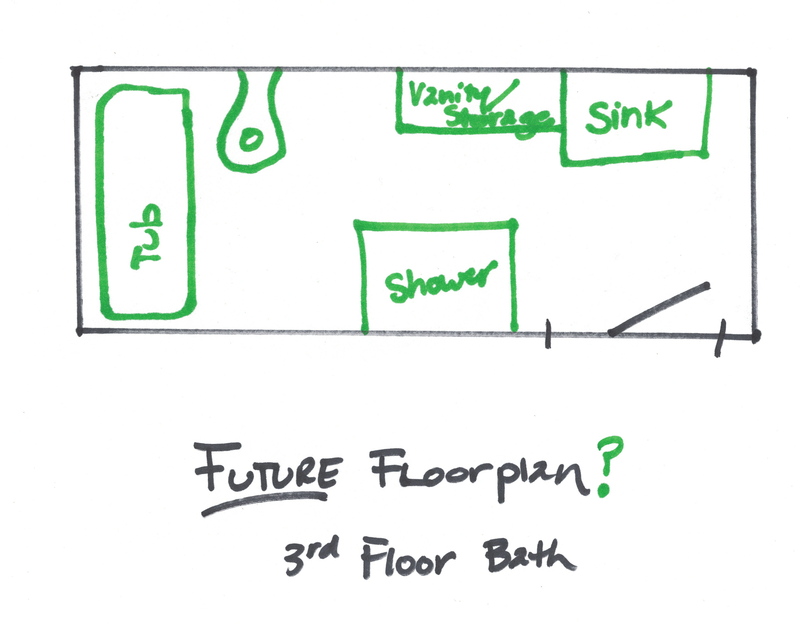 Again, I’ll break this down more in the next post, but we’re going to move the toilet around, and put in a period-appropriate sink, and a clawfoot tub/shower combo. When the house was turned into apartments, and then turned back, the back of the second floor really underwent some butchering, and the attempt to put it back together did not go so well back in the day. When people go through the downstairs, it’s “OOOOH!” this, and “AHHHH!” that. When they go through the second floor, there’s a lot of stopping and stammering. “I don’t understand what is happening,” is said a lot. We’re going to take it all apart. And put it back together. The quality of the work isn’t good. It’s falling apart. It’s not original. And it’s not super functional. This is JUST the back half of the house. And again, not to scale. The sitting room and master bedroom are really much larger. 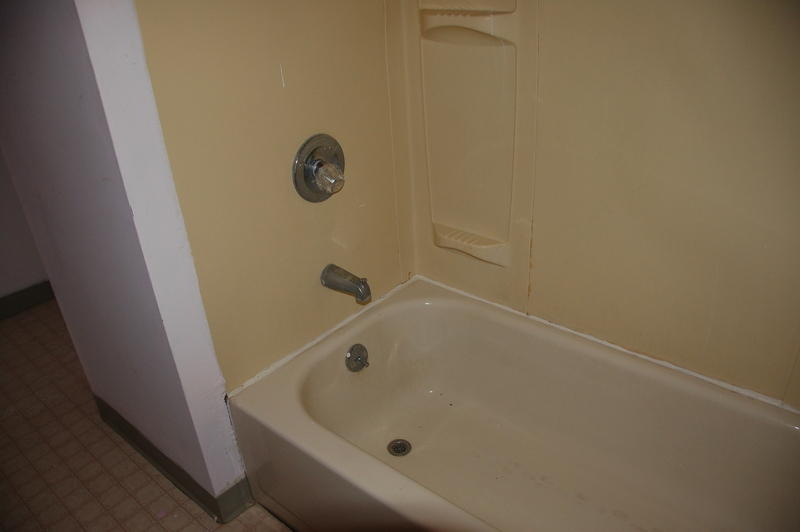 On the upper left of the floorplan is the first full bath. 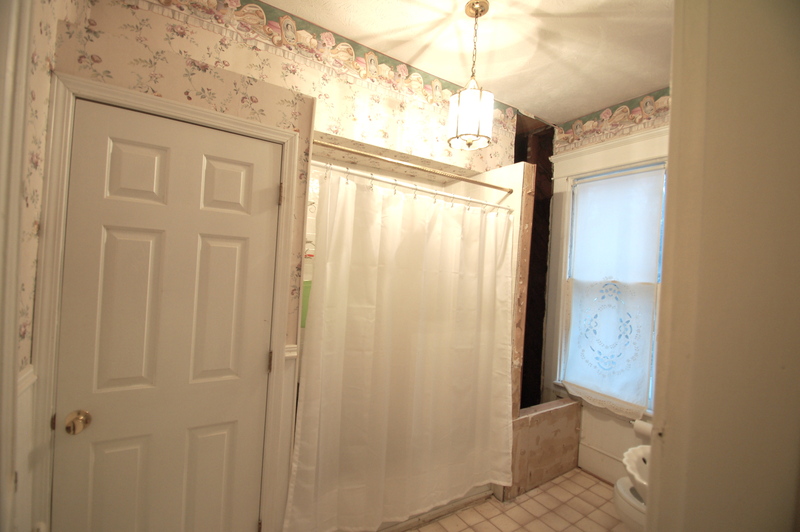 This bathroom is fully functional, with a walk-in shower. It can only be accessed by walking through the bedroom with the balcony. (So we call this the balcony bathroom). 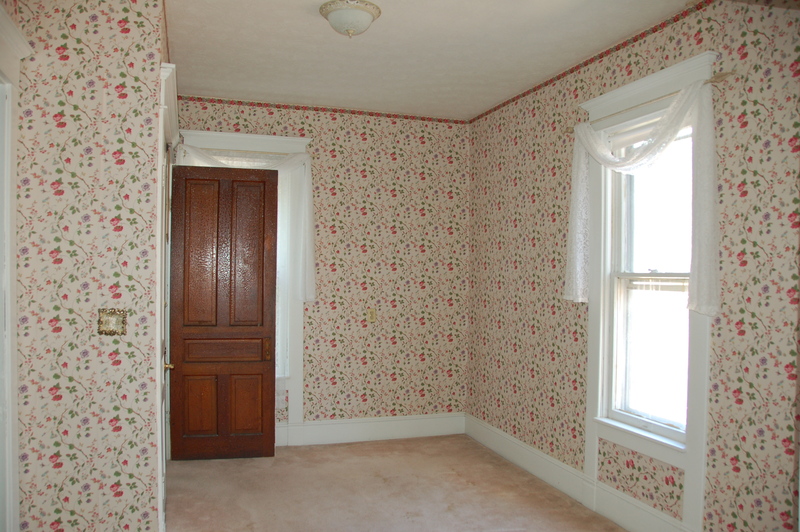 Also, the stairwell to the third floor is in this room. It’s super awkward, all the way around. 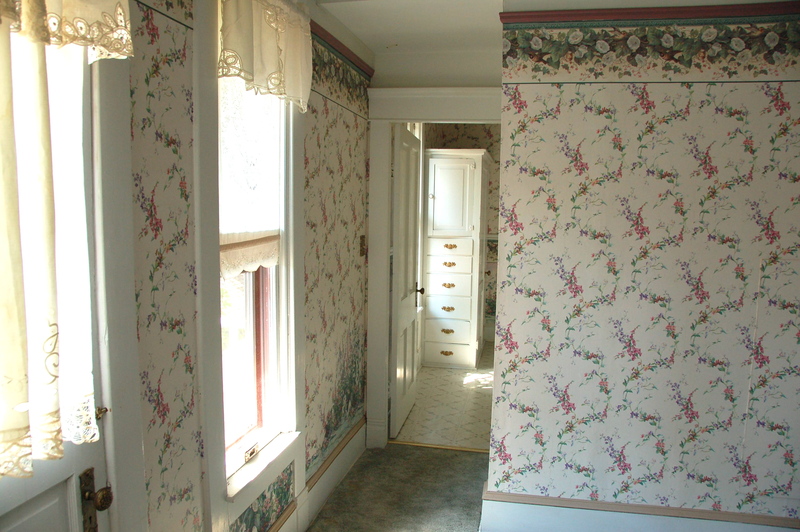 It’s a great ensuite for guests, but only the guests IN that room. Any other guests have to go through a bedroom to get to the only shower on this floor. The ceiling is a wonderment. It’s really a nice-sized room, but the shower layout and built-in cabinet make it feel really tiny. The window lets in great light. The showerhead has a matching sconce! Terrifying – don’t worry, it doesn’t work. It really sets off your seasonal allergies. Also, Many of these pictures are from when we came through the house with a realtor, because I took so many pictures then. 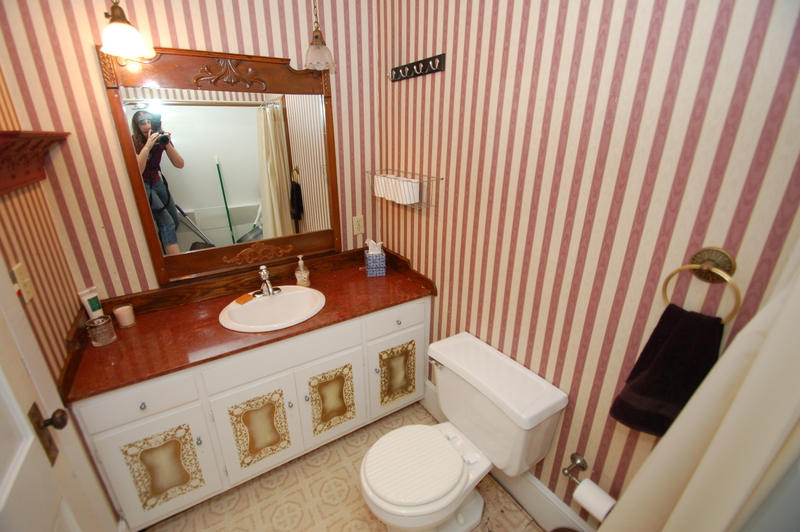 And I HATE people who take pictures of houses with the toilet seat up. Off the center Hallway on the floorplan, to the left, is the Hall Bathroom, that’s connected to the Master Bedroom. It’s right at the top of the servant stairs. There’s a little landing – if you go to the left, you’re in the bathroom. To the right, the dressing room for the master bedroom. This LOOKS like a full bathroom, but SURPRISE! Only the sink works. There’s all sorts of half walls and partial walls in this room. 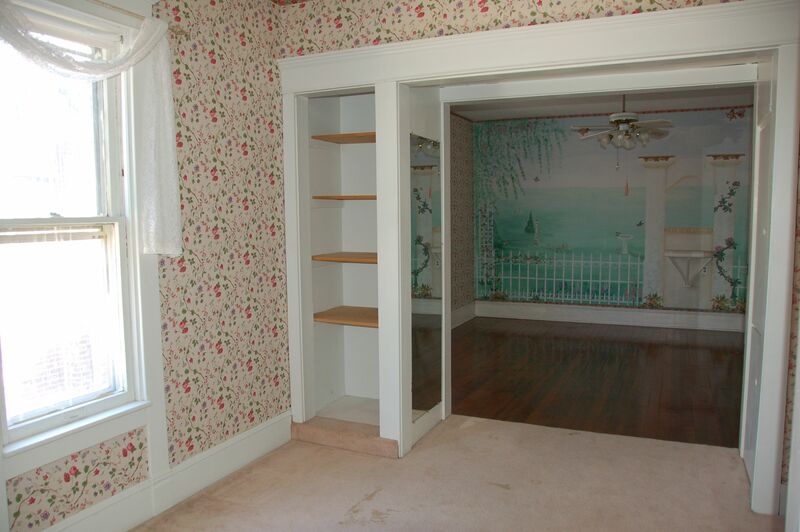 There’s a closet (which is nice to have), but the wall doesn’t go all the way up. Nor does the water wall for the shower. It’s REALLY choppy. I know the window placement doesn’t help the fixture placement in here, but we can do better. See? Look at the walls going up the shower and the closet. So odd. 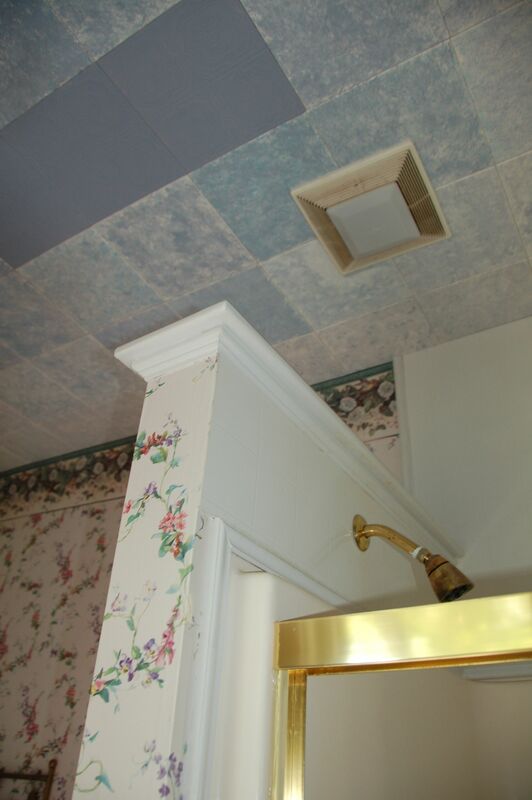 The useless chimney that we removed during the kitchen remodel came through this room, so now there’s a gaping hole. 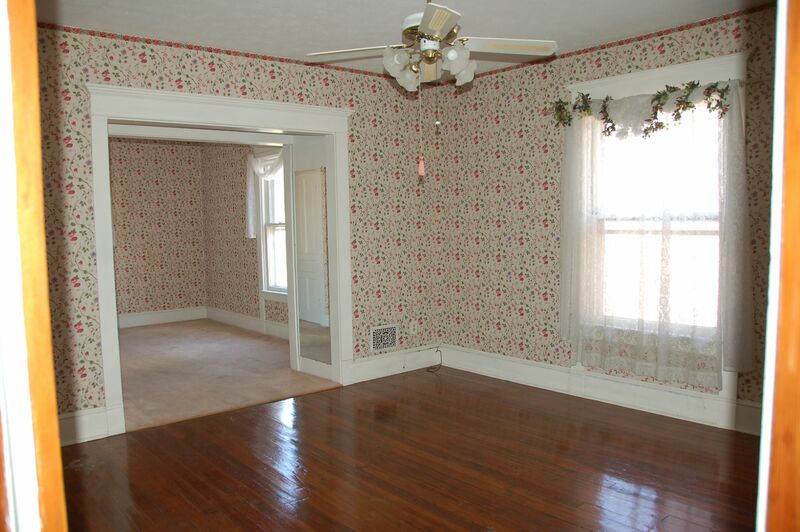 When we bought the house, it was carpeted. There is no part of me that understands that. The carpeted area just outside that door? That’s the pass-through / landing from the hallway. 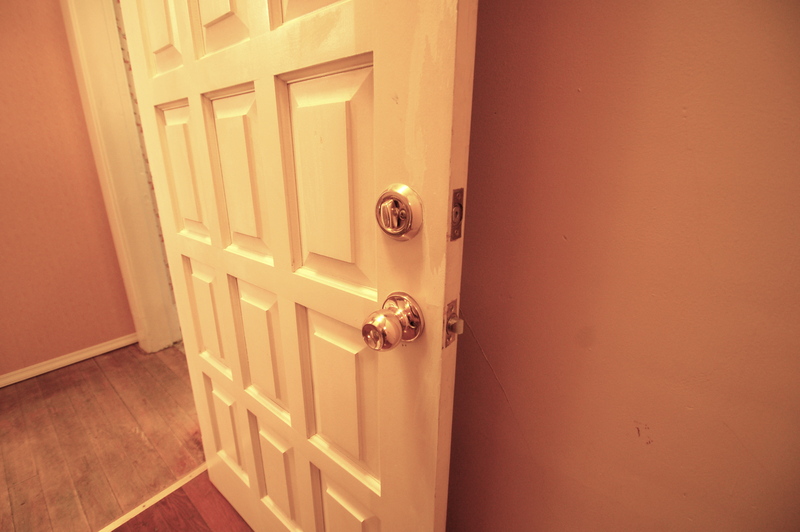 The door to the landing area is an exterior door with a dead-bolt. Probably from apartment days, but I prefer to think that we have the most secure bathroom in Indiana. Here’s a view of the landing from the Master Bedroom Sitting Room, looking into the bathroom (turn left out this door, and you’re in the hallway). This bathroom isn’t super functional. It’s not a dedicated master bath. 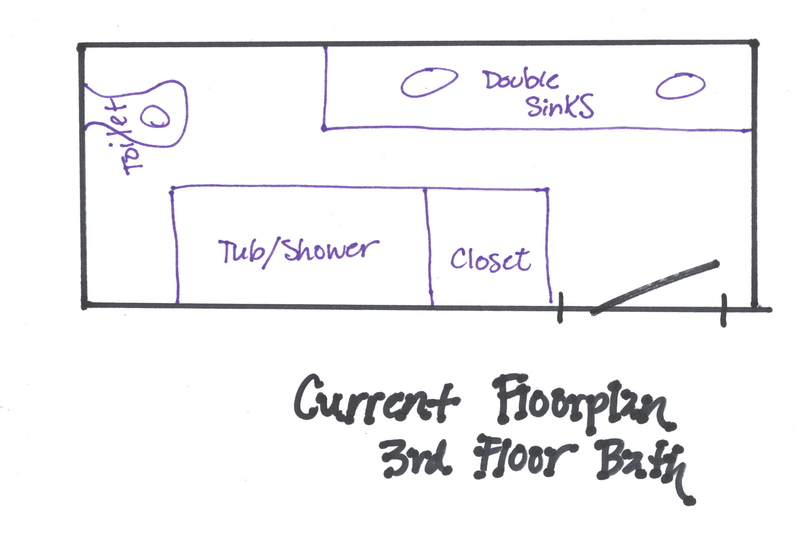 Which isn’t a HUGE deal, but once again, guests have to either share our bathroom, or go through another bedroom to get to one. 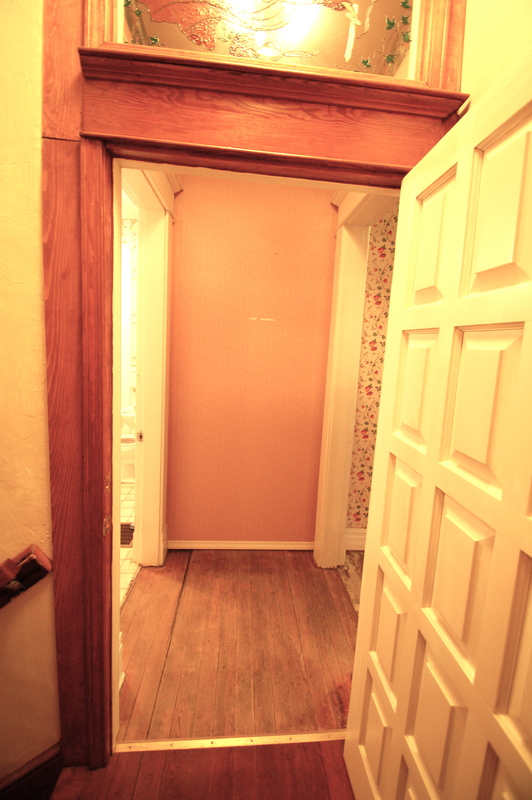 It feels really awkward – lots of doors and passages. So, how do we fix this? Take it out, and start again. The pass-through / landing is wasted space (but needed). And there are still two bedrooms at the front of the house to account for. I hate the idea of people having to go through other spaces to get to a bathroom – and we really do have enough people over often enough to warrant this as a concern. So, we add a bathroom. We make the master closet skinnier, but longer, so it takes up the same square footage. We take some of the space from the bathroom, and add it to the landing to create a small – but perfectly functional – hall bath to service the front two bedrooms. 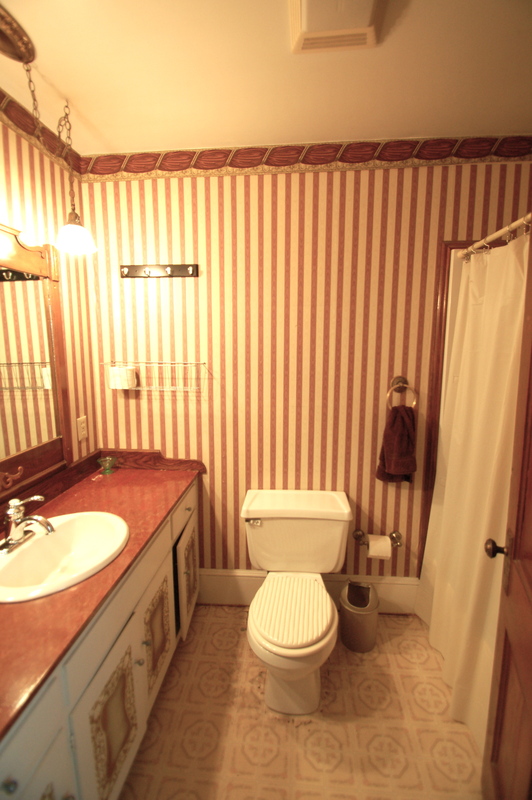 And THEN, we add a proper master bath in the sitting room of the master bedroom. Which, as we learned in part two, was pretty much what happened in the Victorian Era, anyway. The dressing rooms were often turned into bathrooms! This is standing in the master bedroom. 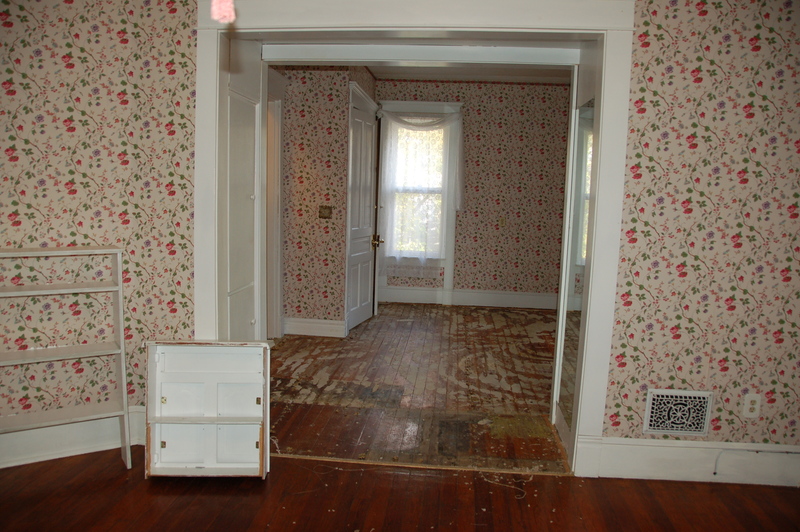 The carpeted area is the sitting room – which will be the master bathroom. A good view of the Future Master Bath. The door that’s open, leads to the closet. 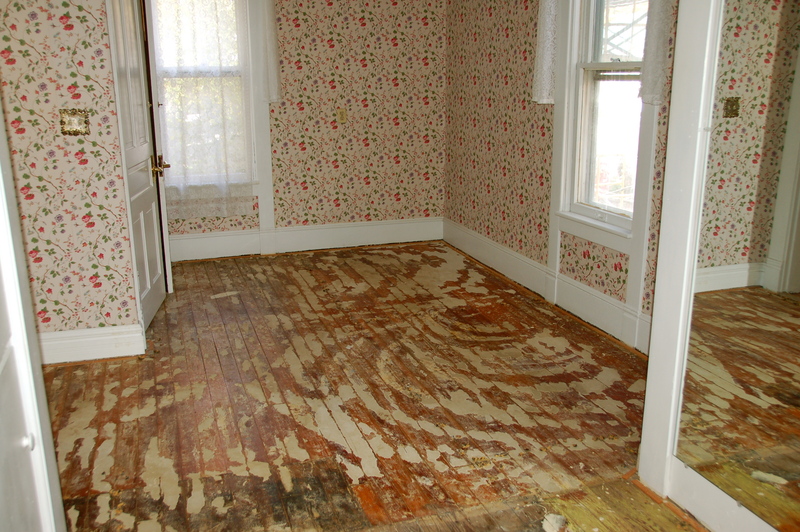 Here’s after carpet removal. 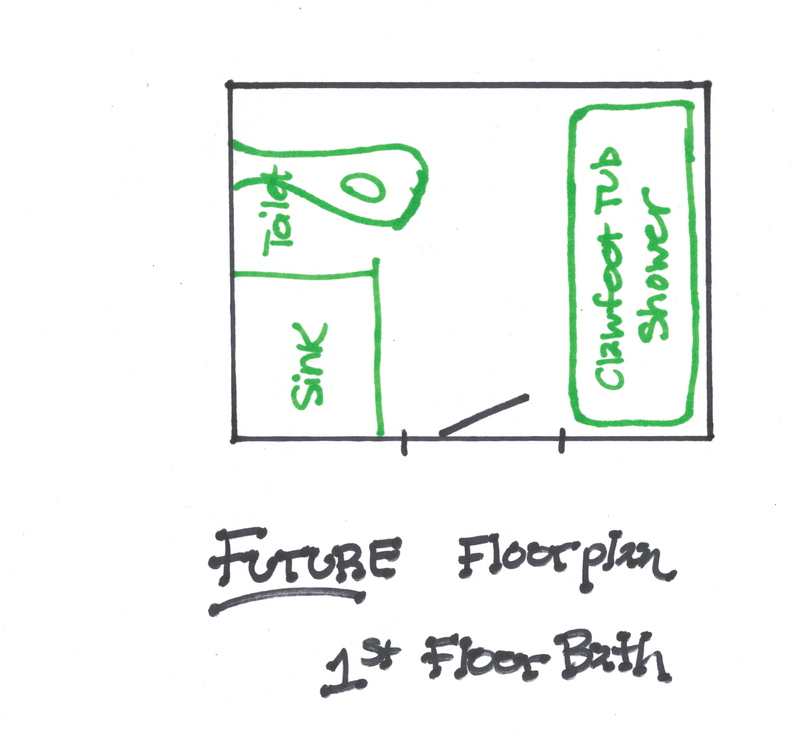 I’m not sure what the final floorplan will be for this bathroom. Two vanities? Large shower? Fireplace? So many intriguing options. When this was apartments, this was a kitchen. 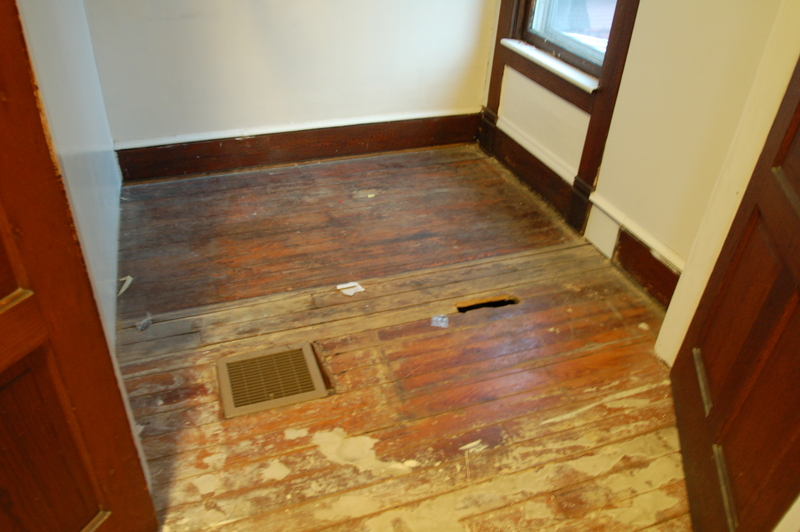 The floor is salvageable, but it won’t remain here. There are sections of floors in the front bedroom that still have water damage, and there’s significant damage in the closet in this room. We’re going to take this floor up, and use it to repair the damaged spots elsewhere on the second floor, and then tile this space. Here’s the closet. 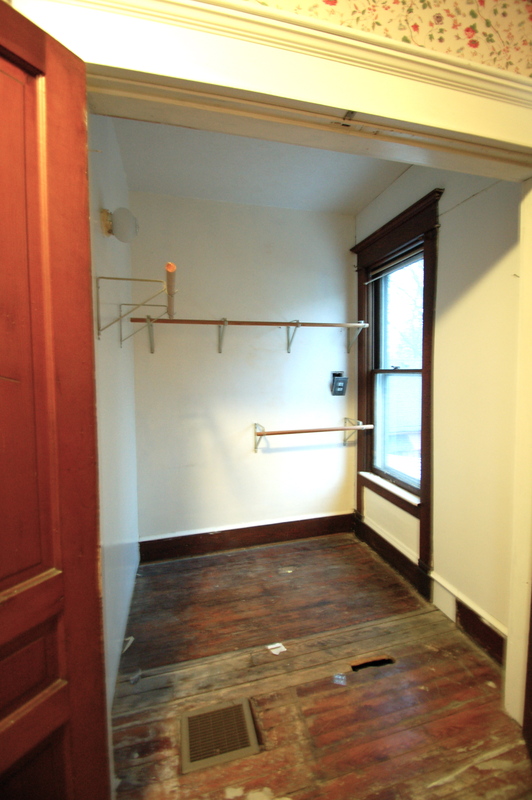 A decent space – we’ll shrink it a bit to make room for the Small Hall Bath, but we’ll make it longer. The floor is a hot mess. This plan makes sense, right? Please don’t expect this to be done anytime soon. This is going to take A LOT of resources. We’ll most likely have to take out a loan for this, because we’ll need to take it all apart at once. I’m hoping that we can start on this in about 6-7 years. Fingers crossed! But this is part of the reason for doing the first floor bath now. 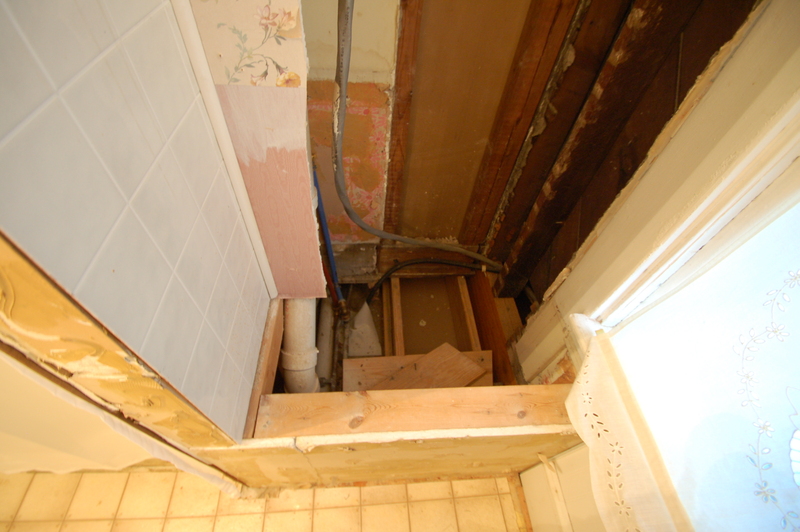 When we take the back of the house apart, we’ll need a functioning bathroom, because we might be without one up here for several years. On the third floor is the bathroom we use currently. Though we’re starting to move down, the third floor was our primary home for the first couple of years. Up here, there are four technical bedrooms with closets, a bath, and storage room. When we moved in, the four bedrooms served as a living room, bedroom, and two offices, with the storage room being used for storage and the dog feeding station. Eventually, the hope is to slightly reconfigure the space, and add a mechanical room to add HVAC to the third floor (and assist with the second), keep the bathroom, and turn the four remaining rooms into three : a large storage room, a vintage game room with kitchenette (that can service as an in-law suite or bedroom), and a larger bedroom, that we’ll functionally use for our chandelier refinishing hobby. Again, we are YEARS away from this. 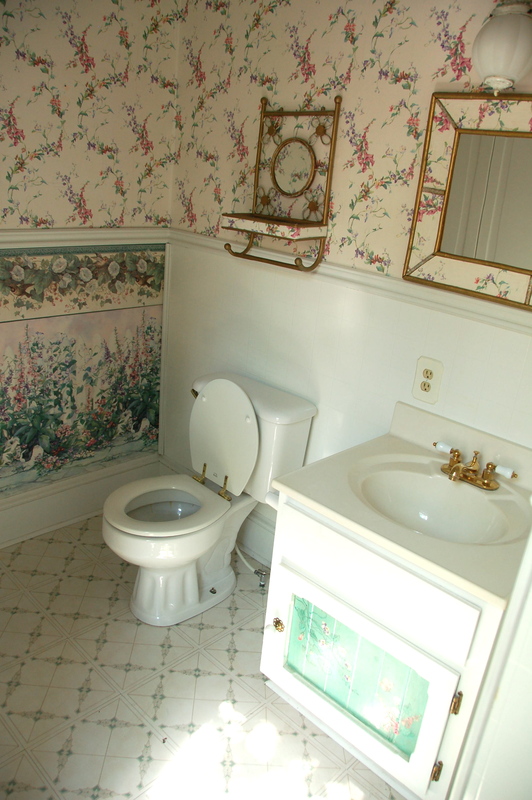 This bathroom was added to the house in the 1990s. I love all the sloping walls and ceilings, but of course, it makes things like floorplans awkward. And this room will remain awkward, and that’s okay. Even though this space wouldn’t have been servants quarters, I envision this bath functioning that way – stark, plain, simple, and really beautiful. Here’s when we moved in. It only took minor tweaking to make this bathroom function upon moving in. We used leftover peel-and-stick vinyl from a project at Jackson Street to redo the floor (it was so gross, and I needed it to feel clean). 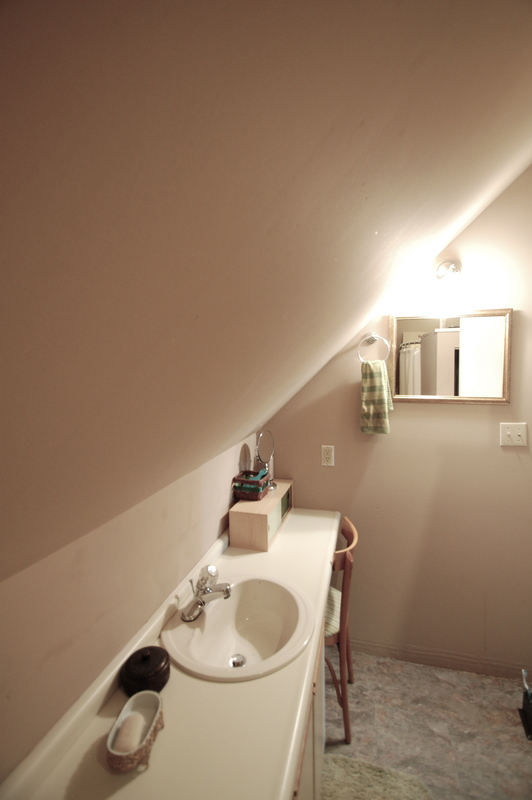 We added a mirror and a sconce for more lighting, and switched out the shower / tub fixtures. And painted! I dumped three partial gallons of paint together, and got this khaki color. It felt at least livable! The double sinks and counter space is nice. This is before we switched out the fixtures. It’s not glamorous, but it works. And it’s clean, which is so important when living through a renovation! I’ve always dreamt of having a clawfoot under the sloping eaves of a roof. So, I’m going to do that here! 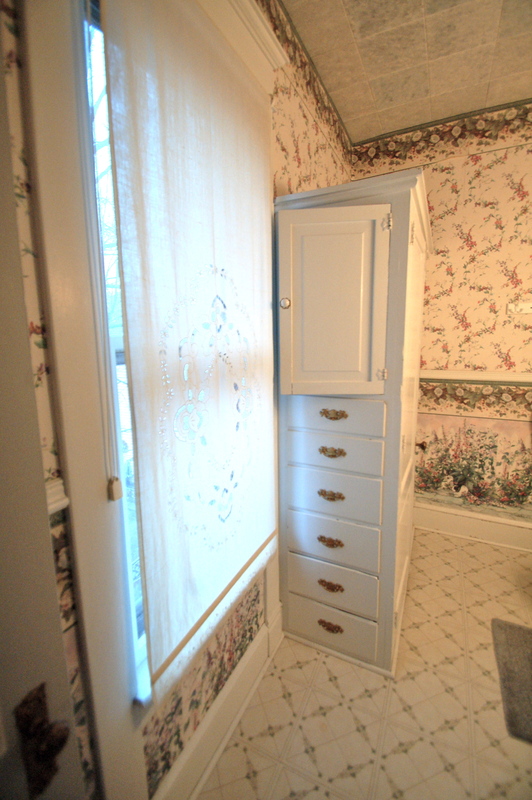 We’ll have room for a simple shower, and there’ll be no need for double sinks here, so we’ll go to one, and add a furniture piece for some storage. Again, this isn’t going to happen for years. But knowing the end result of what we need (and what we want), means we can go into the first bathroom renovation knowing the total end game. I’m so excited! If you’re thinking, “What on earth is she going to do with all of those bathtubs?” The answer is, I’m going to take baths in them. All the time. I will float from bathroom to bathroom each week, and make sure that each one is lived in and LOVED. And I CANNOT WAIT. Next up? 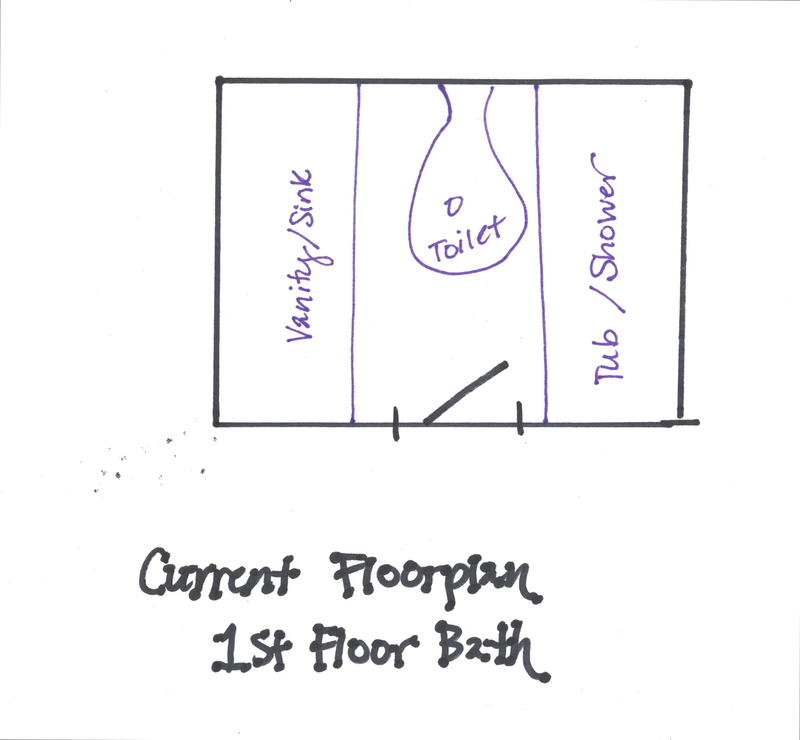 More details about the first floor bathroom plans! Next PostThe First Floor Bath Begins! As always, I’m enjoying your plans and how you describe them. I TOTALLY understand that. I live by lists: What do I need, what do I want, what do I hate right now. That helps to get everything you want. In our last house, my husband wasn’t nearly the marathon runner that he is now, and he has a lot of tape and gadgets and things he needs in the bathroom as he gets ready for his daily runs. So when we do our master, I’m planning to make a niche / cabinet JUST for his running things. Stuff like that. I almost forgot a place for the trash can in the kitchen remodel. Oops. But I didn’t! That’s smart. The danger we run into is the fact that we have our house torn apart right now and are updating the plumbing and stuff everywhere, but we aren’t planning on doing the master bathroom for a few years (to save up so the finishes are exactly what we want them to be). So one thing I just decided on the spot yesterday morning after having a plumber in for a quote was to not bother with the second vanity in the master bathroom (we plan to have a water closet and I was going to add an additional vanity in the main section of the bathroom so we could both get ready at the same time) but after hearing we’d need another stack to deal with that ONE vanity I decided I didn’t need it after all. And in fact, I’m kind of glad because the more I think about it, the more grateful I am for the extra room that I can play with now! I’m hoping to have a proper victorian-esque makeup table but with modern lighting ha ha and a place for literally everything! The notion of creating a list for every tiny thing you’ll need in a space is such a great idea. Functionality first, then make the function look pretty! 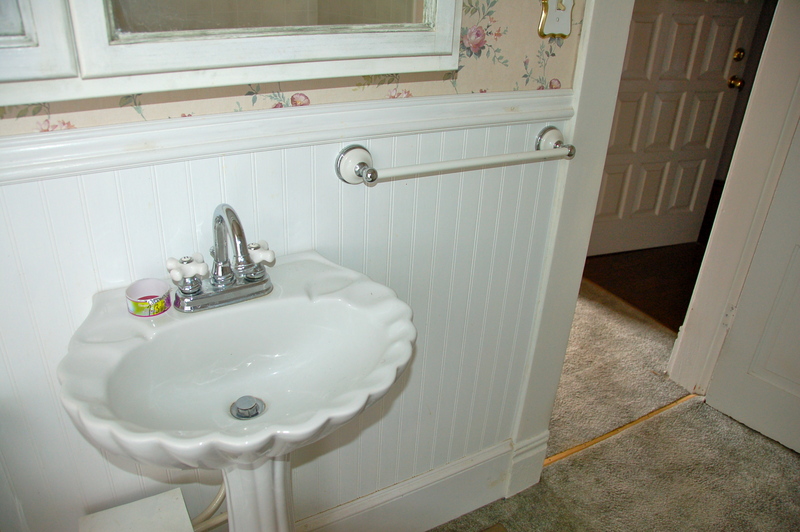 I’ve really enjoyed your posts about bathrooms and emphasizing just how important is is to get them right! The Victorian cookbook was awesome. Thank you for sharing your renovation journey with us! I’m so glad you love it, Julia! I love that cookbook IMMENSELY. Oh my gosh – so many bathrooms! We only have 4 and I thought that was a lot! Good luck and keep us posted 🙂 Nice blog too, by the way! I love this series! so much to learn. 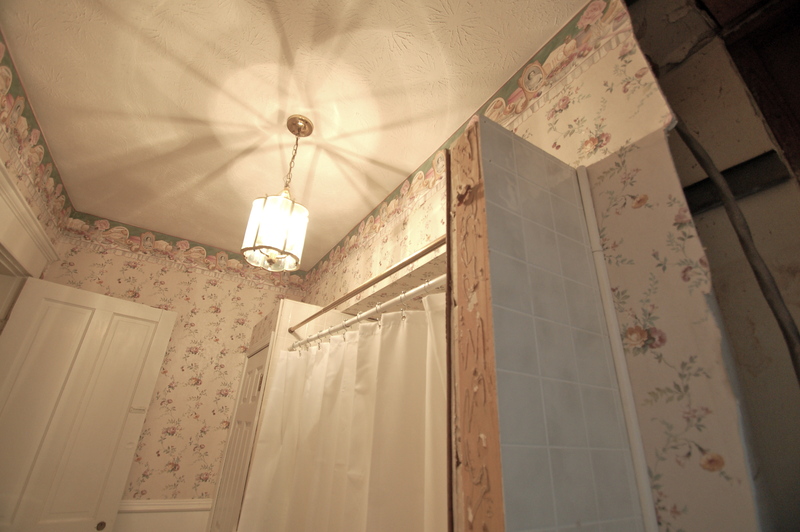 I am also renovating both of our 1908 bathrooms, we have a lot of original features intact, but it is still tricky to find balance between the old and the new. I’m playing catch up with your amazing restoration today, Amy! 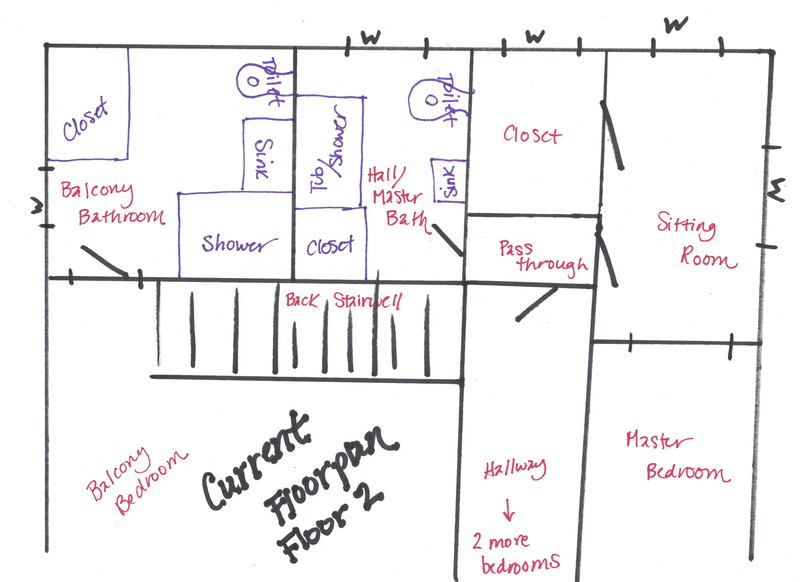 I think that the new floor plan for the 2nd floor will work very well, it looks like a big improvement. All those bedrooms and baths; once you are done, you two can stay in a different room every night of the week! It will be like a permanent vacation, no two nights in the same bed, LOL. We have 5 bedrooms in our old house, and I told my wife that we should switch around some now that the kids are grown and gone, as long as we wind up in the same room!